MADE BY: The project is a joint effort of researchers at Drexel University, the University of Pennsylvania, Colby College, Bryn Mawr College and Virginia Tech in the US, and Korea Advanced Institute of Science and Technology (KAIST), Korea University and Seoul National University in Korea. DESCRIPTION: National Science Foundation press release describes the robot as: ”Jaemi HUBO embodies efforts to advance humanoid development and enhance the concept of human-robotic interaction. The project’s goal is to enable humanoids to interact with their environment, and enhancement plans include enabling the humanoid to move over rugged terrain, in unstructured environments and to interact socially with humans and handle objects…” The project’s other goal is to educate the public, particularly young people, about robotics. Jaemi is housed at Drexel University of USA. CONTROL AND SOFTWARE: Primary computer runs Windows XP embedded with real time extensions (RTX) for windows. A real-time low-level system will control hardware and motors, read sensors, and manage basic functions like balance. Using a second embedded computer, higher level software will control walking motion, arm gestures, vision & audio processing, and artificial intelligence. VISION: A stereo-vision camera will be installed at the head, in front of the facemask and the head will act as a pan tilt unit. The camera will move together with the head. All vision processing will be done on board by the second computer. SOUND AND VOICE PROCESSING: Microphones will be installed on each side of the head, analogous to human ears. Combined with speakers, this will allow spoken communication with Jaemi. Number of External Sensors and types: Uses 3 axis Force-Torque (F/T) sensors at each ankle to detect contact with ground, and to measure the Zero Moment Point (ZMP) location. 3 Axis F/T Sensor in the right wrist measures torques at the wrist. During a gesture like a hand shake, this measures the forces applied by a human, and lets the arm move in response. Number of Internal Sensors and types: 6 degrees-of-freedom inertial measurement unit (IMU) using 3 accelerometer and 3 rate gyro axes provides orientation and angular velocity of torso in space. Accelerometers in each foot also measure their orientation, which is used for landing control. Planned Upgrades & Development: Targeted software improvements include capability to move over rough terrain and in unstructured environments, to handle objects and to interact socially with humans. As development progresses, particularly for rough terrain navigation, improvements in foot actuation (such as the addition of toes and series-elastic actuators) may be employed as well. 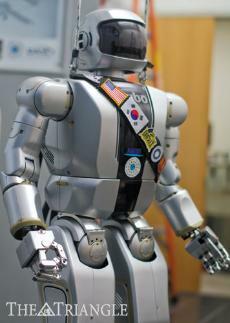 Planned Use: Jaemi Hubo will be a prototype for a general-purpose humanoid robot. Rather than building custom robots for each task, a humanoid can use existing human interfaces with little modification, massively reducing the cost of adding robots to a human environments like homes and workplaces. Please click “here” to visit the link at Drexel University website for more technical data and parts. Please click “here” for the press release. Please contact ngianakaris@drexel.edu at Drexel University for more information.